“Wisdom hath built herself a house,” wrote King Solomon in Proverbs 9:13, one of the many sayings in which he links wisdom with houses – a metaphor that conveys a sense of solidity and permanence. 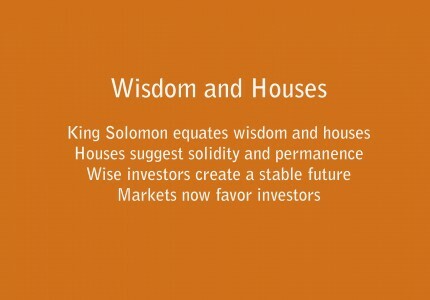 The wise King was right: wise investing in viable income properties can create a solid, stable future. And for those following Jason Hartman’s recommendations on buying investment income properties, current changes in the US mortgage market mean new opportunities for investors. Current mortgage rates have fallen to near-record lows. But according to a recent report on CNBC.com about the state of the current housing situation, in most major markets mortgage applications have slowed considerably. Those who still own their homes have already refinanced at lower rates, and large numbers of other homeowners can’t refinance due to the high fees or a lack of equity in the home. In addition to a limited pool of qualified applicants who already own homes, relatively few people who, in a different economic climate would be buying homes, are able to do that now. Many are unable to qualify for mortgages or meet other purchasing criteria, such as making the down payment and covering closing costs. In the end, these potential homebuyers end up remaining renters for the long term. Although mortgage payments actually may be cheaper than rent, these purchasers are locked out of the process for lack of down payment money, damaged credit or chronically low wages. The rosy picture of a US housing recovery may not be quite what it seems, as the mortgage industry continues to fluctuate and homeownership still remains at record lows. But investors following Jason Hartman’s recommendations for maximizing returns from income property may find that the current conditions open new windows of opportunity to combine wisdom with houses, as Solomon thought.